What you wear when you workout is important. Your attire and gear can help keep you comfortable and in some cases, is very important to the exercise you are doing, like good shoes for running. Wearing a sweatshirt while exercising to promote extra caloric burn has some merit, but needs to be taken in consideration with its minor benefits and possible health concerns. When you run, your heart rate increases to supply your body's muscles with an adequate supply of oxygen-enriched blood. The faster your heart beats, the more energy is required and thus, the more calories are burned. When you wear a sweatshirt, your body temperature increases, circulation increases and heart rate increases in an effort to maintain body temperature. As a result of this increase in heart rate, you may burn more calories while wearing a sweatshirt, but it's not always a good idea. Heat exhaustion occurs when body temperature rises and your body is unable to keep up. According to MayoClinic.com, heat exhaustion is particularly prone to happen when coupled with intense physical activity. If you are running in a sweatshirt, you may encourage heat exhaustion or a more serious condition, heat stroke. 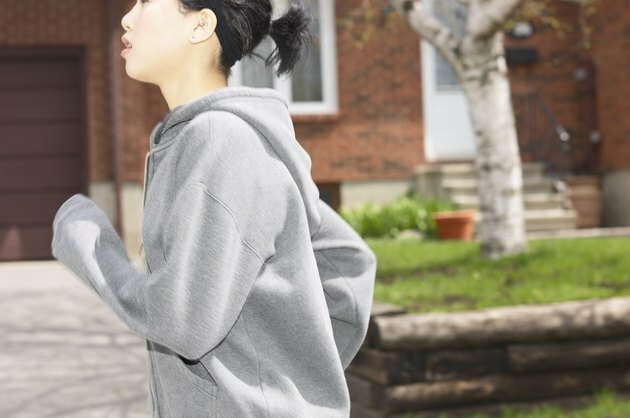 If you are running with a sweatshirt and you get too hot, immediately take it off. Finally, always stay hydrated by drinking plenty of water when running. The amount of calories you burn through running is contingent on two main factors: intensity and duration. At higher heart rates, you will burn calories faster. But more intense activities are not as sustainable. Low-intensity jogging or walking may help you burn more calories than running if you do it long enough. Because sweatshirts will increase the intensity of your exercise, they may limit the duration so severely that it negates the sweatshirt's calorie-burning benefits. There is a common myth that wearing additional layers of clothes makes you lose weight faster, because you sweat more. While wearing a sweatshirt will make you sweat more — and though increased sweating indirectly burns more calories through increased heart rate — the majority of weight lost through sweating is water weight. Wrestlers and other athletes who attempt to lose significant amounts of weight in a short amount of time often exercise to lose water weight. Water-weight loss is extremely temporary and is not a healthy or sustainable form of weight loss.